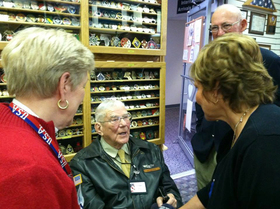 First Lady Ann LePage with The Maine Troop Greeters at the "Welcome Home" to Korean War Veterans. "These heroes are NOT forgotten," the First Lady said on her Facebook page. The event also welcomed home 180 military men and women from Afghanistan on an incoming flight to the Bangor International Airport. The following is a list of some of the Memorial Day Weekend events scheduled around the state to honor Maine’s sons and daughters who made the ultimate sacrifice for our country. Please join the Greater Bangor Maine Military & Community Network for a showing of the film A Matter of Duty, Thursday, May 22 in the Donald P. Corbett Building, Room 100 at the University of Maine, Orono. A Matter of Duty details Kennebec Sheriff Randy Liberty’s personal battle with PTSD and several veterans in his charge at the Kennebec County Jail. Liberty’s honesty about his own condition and his efforts to help other veterans vividly depicts the continuing impact of war on the men and women who have served our country. Learn about resources available to service members, veterans and their families. Use your military experience and training to obtain a job with the State of Maine, one of Maine’s municipalities or the federal government. - 10 a.m. Keynote Speaker -- Maine’s First Lady, Ann LePage. Please dress appropriately and be prepared for an interview. If available, please bring proof of military service and a resume. Registration is recommended but not required. Click to register. For more information, contact Auta Main at 207-623-7975. TTY users call Maine Relay 711. Sponsored by the Maine Military and Community Network, Employer Support for the Guard and Reserve and the Maine Department of Labor. Contact a Veterans' Representative Near You! If you have questions about this email or want to know about services available to you, contact a Veterans' Representative in your area. "Greg was a participant the Department of Veterans Affairs Vocational Rehabilitation and Employment Program (VR&E) from 2011 through 2014. The VR&E program provided him with the funding (tuition/fees/books and supplies) and support for the completion of both Associate and Bachelor’s degrees in Occupational Safety and Health. When Greg completed his degrees/training, he was referred to the State of Maine Department of Labor for employment assistance. He was currently employed by Harbor Technologies in Brunswick and wanted to improve/explore his employment options. Joseph Hughes, Portland CareerCenter DVOP, met with Greg several times over the summer and through the fall, sharing labor market information, discussing prospective job opportunities and developing a resume, cover letter and an individual employment plan. Greg was very motivated and interested in becoming an Occupational Safety and Health Manager. Joe arranged for Maine's Safety Works! Director, Dave Wacker, to meet with Greg and conduct an informational interview. They had a great meeting, focused on what the job would entail and issues that might come up depending on where he worked. Dave said Greg should keep in touch as questions came up etc. Greg had a few interviews throughout the fall, which went well and helped him to further narrow down where his real area of interest was--risk management and assessment. So the job search was well underway and, bingo, in November Greg called to say that he had been offered a fantastic job! Greg would be starting with N.S. Giles in Bangor, as their Safety Director at an excellent starting salary! Benefits included company car, gas card, paid hotel stays as needed, new computer, option to work from home if sites visits not required, two weeks paid vacation and health benefits as needed. Greg has been on the job now for three months and is eager to share his story so that others can benefit, too, from working one-on-one with a DVOP, receiving employment services and support. This veterans' update is provided as a service of the Maine Department of Labor. CareerCenters, part of the Maine Department of Labor, offer a variety of workshops and services to help people find employment or upgrade skills. Veterans receive priority for most Department of Labor programs.Maine CareerCenters are an equal opportunity provider.